Today is an other winter day stuck in the office….As I look outside the Ohio landscape is particularly dreary and grey today. This week the sun has made an appearance a total of about 4 minutes…. Ah spring can not get here soon enough. So for about the last half an hour I decide to get lost in some pictures form this past summer. 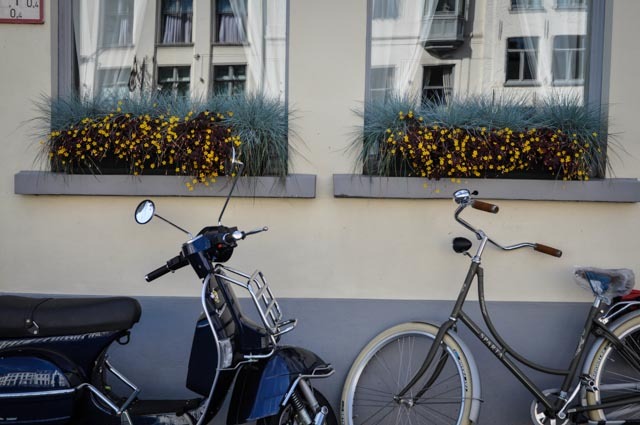 I came upon a picture of a simple / modern window box that caught my eye as I was wondering around the majestic streets of Bruges in Belgium. 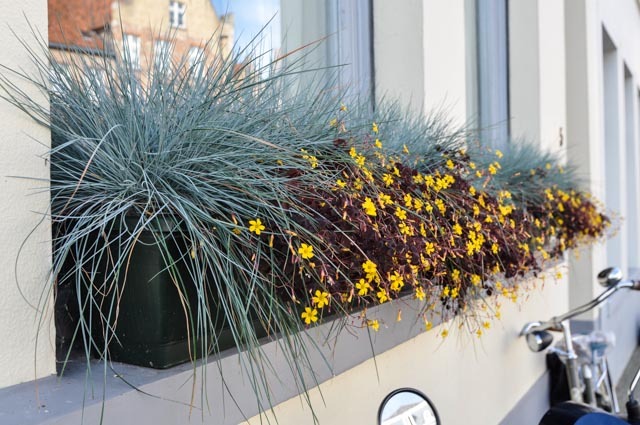 Two plants Festuca glauce – the silvery blue grass and Oxalis ‘Burgundy Bliss’ the burgundy trailer with yellow flowers . After looking at the combo for a minute there are couple design qualities I like about it. First, the texture- the fine blades of the Festuca and the ovate foliage and flowers are great companions. Second, the complementary colors, thought they are not a perfect match the color go great together. Lastly, this window box is low maintenance! In an average summer in the Midwest if you water this combo twice a week that would be more that enough to thrive. I do not imagine when this home owner planted their window box they would think it would be the subject of blog post- but I do believe that there is beauty through simplicity and this is a prime example to me. This entry was posted in annuals, C O N T A I N E R S by Nick. Bookmark the permalink. Nice pinterest pages you have. Do you know my work in Holland. just look on my pinterrest page tonnconcept. I just checked out your website….I love your innovations in grass paving, greenroofs, sport-fields- very cool. I’m sure I saw some your work at Floriade or Appeltern? Next time I am in Holland we will have to meet up. I Saw Your Pinterest pages and I like all the same garden designers you like. It’s nice to see someone who has the same appreciation of both form and loose plantings. And I am thrilled to find your blog. Nice job! Thank you so much for following! I always love it when you find someone who appreciates the sames design styles….I am completely guilty of loving structure in my garden- but at the same time I love an organized chaos in my perennial drifts. After jumping on your website I see we both love the use of texture as well. Thanks for commenting and keep in touch.